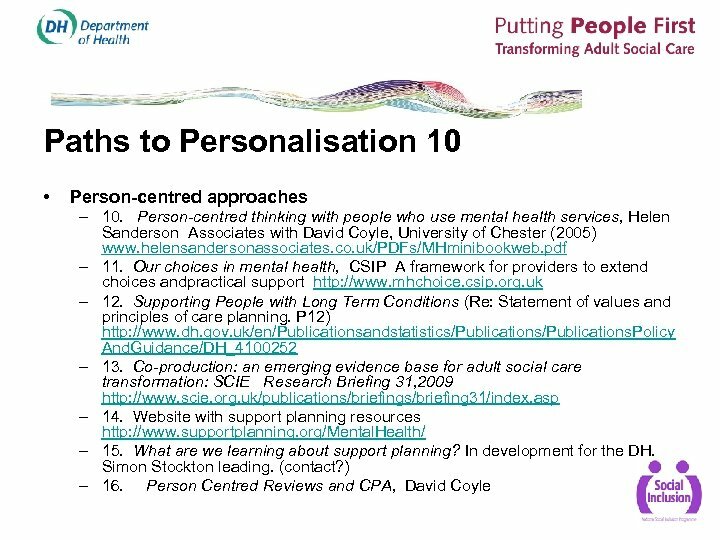 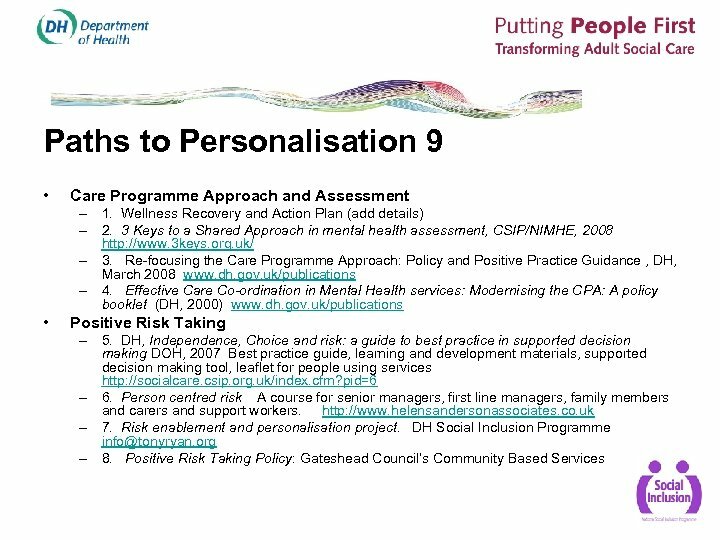 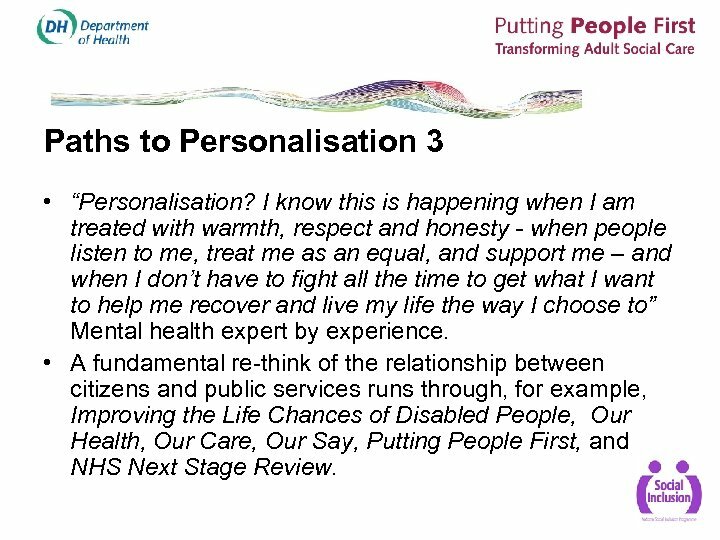 Paths to Personalisation 3 • “Personalisation? 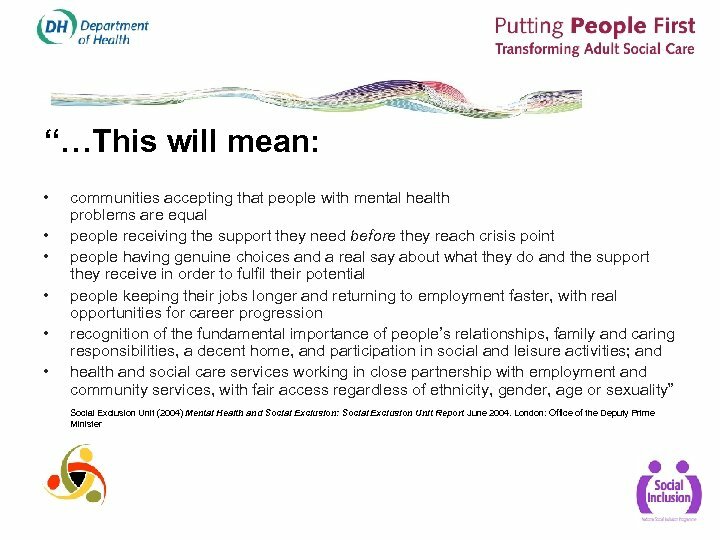 I know this is happening when I am treated with warmth, respect and honesty - when people listen to me, treat me as an equal, and support me – and when I don’t have to fight all the time to get what I want to help me recover and live my life the way I choose to” Mental health expert by experience. 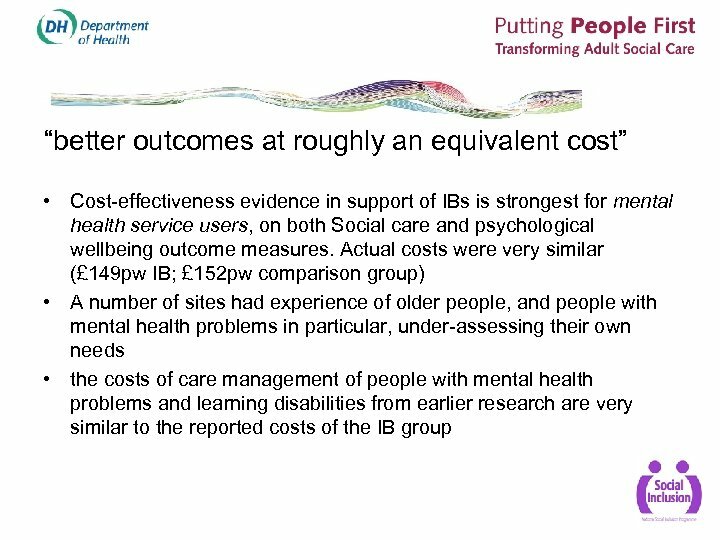 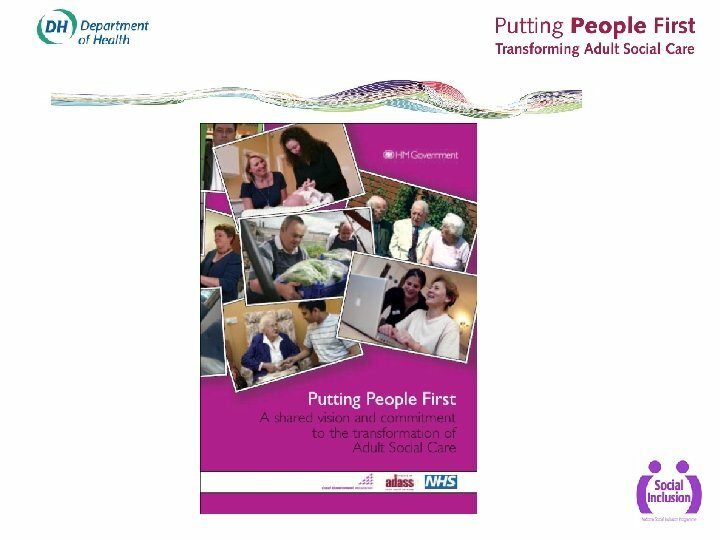 • A fundamental re-think of the relationship between citizens and public services runs through, for example, Improving the Life Chances of Disabled People, Our Health, Our Care, Our Say, Putting People First, and NHS Next Stage Review. 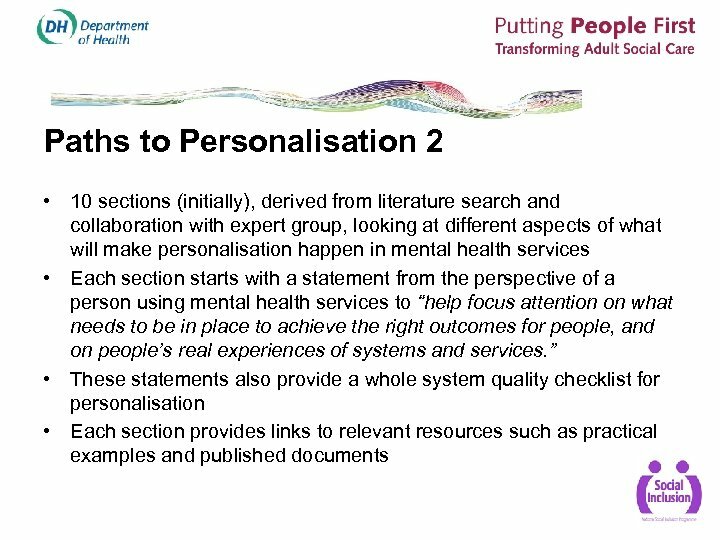 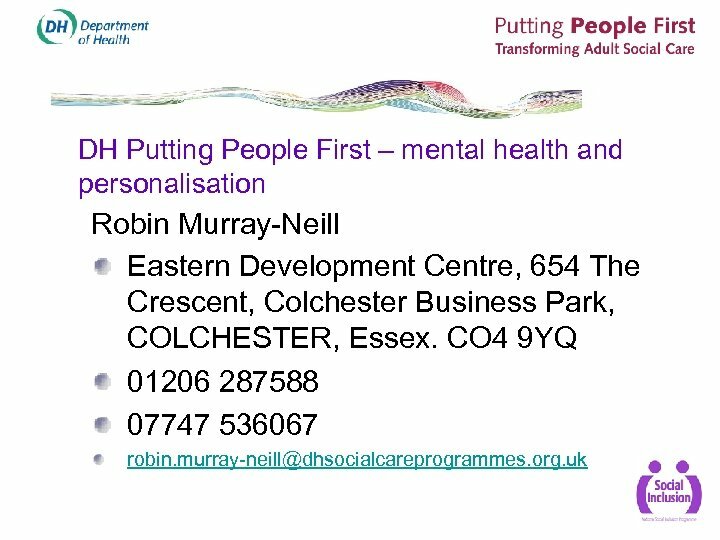 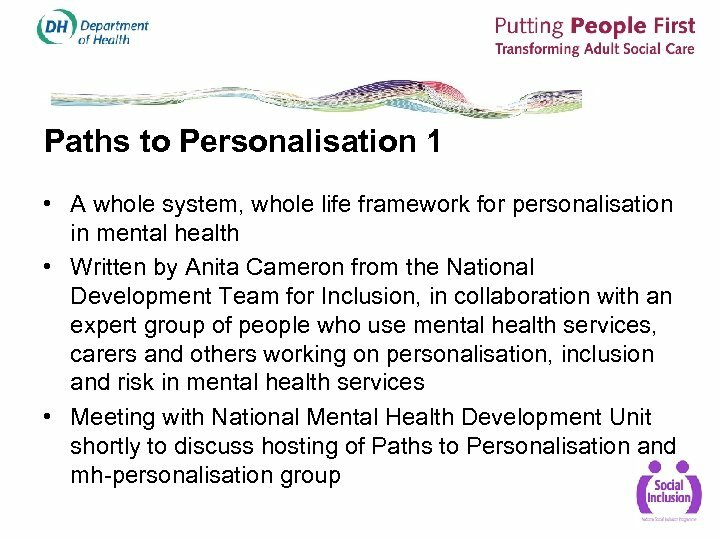 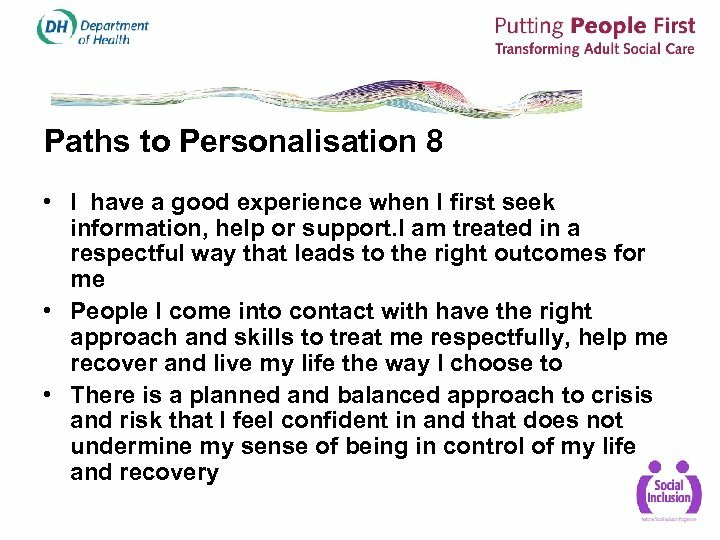 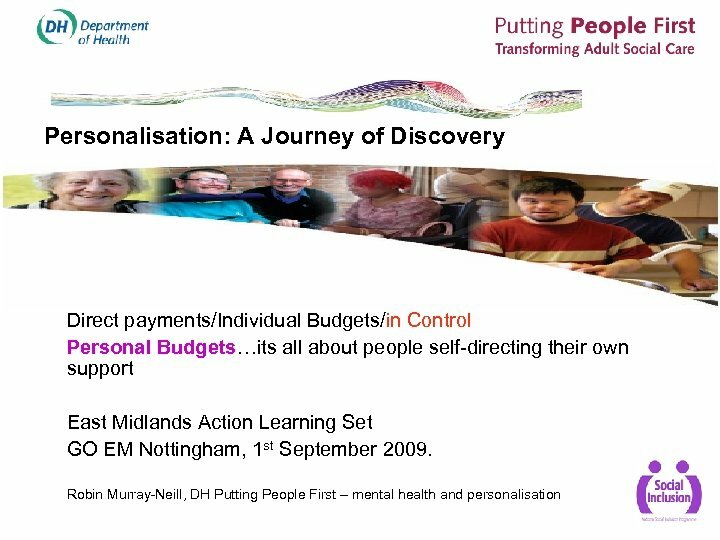 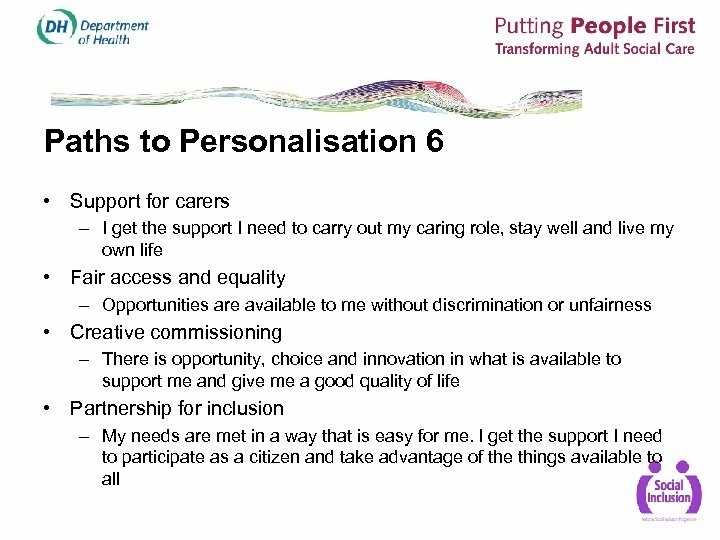 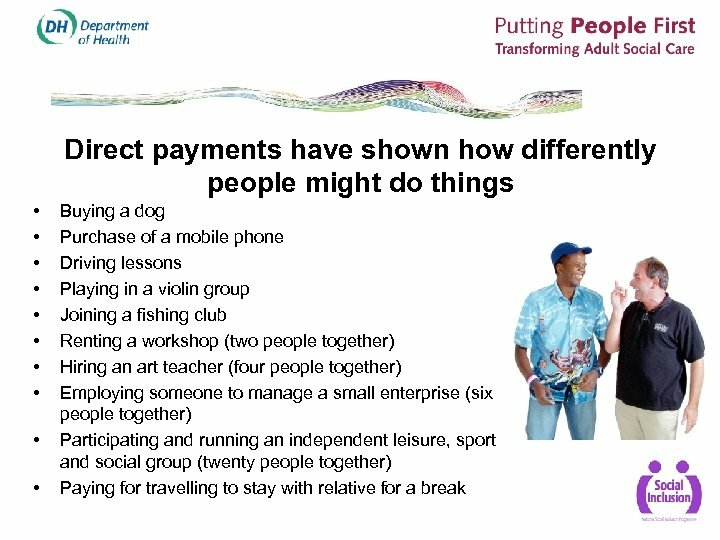 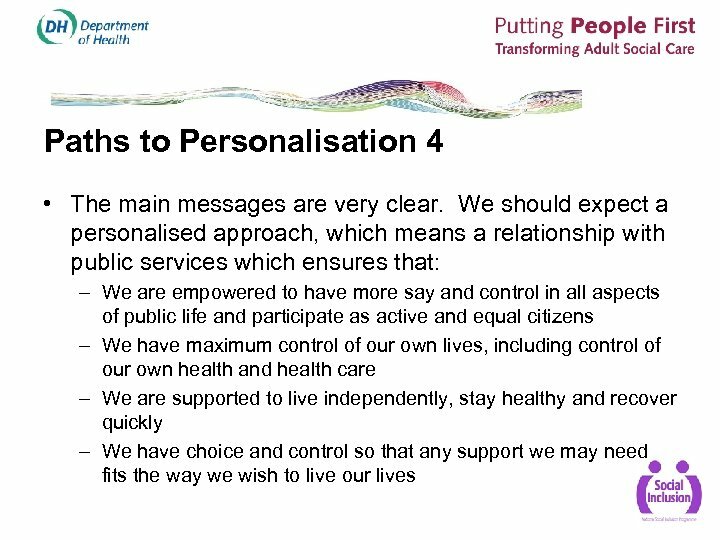 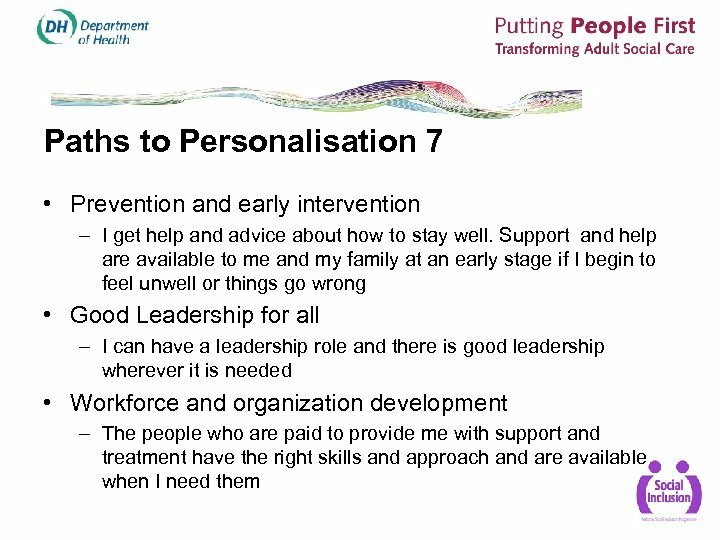 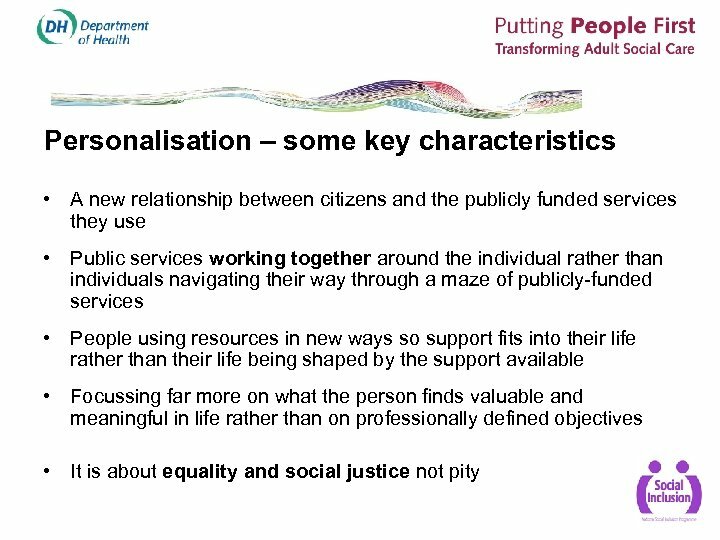 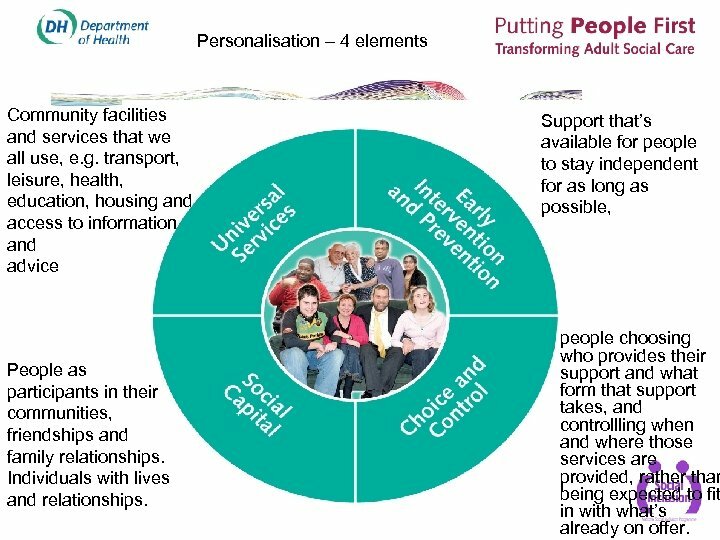 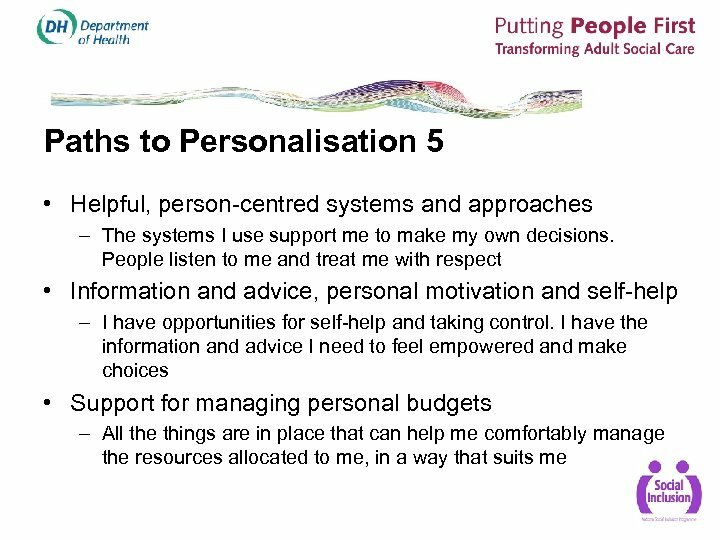 Personalisation – 4 elements Community facilities and services that we all use, e. g. transport, leisure, health, education, housing and access to information and advice People as participants in their communities, friendships and family relationships. 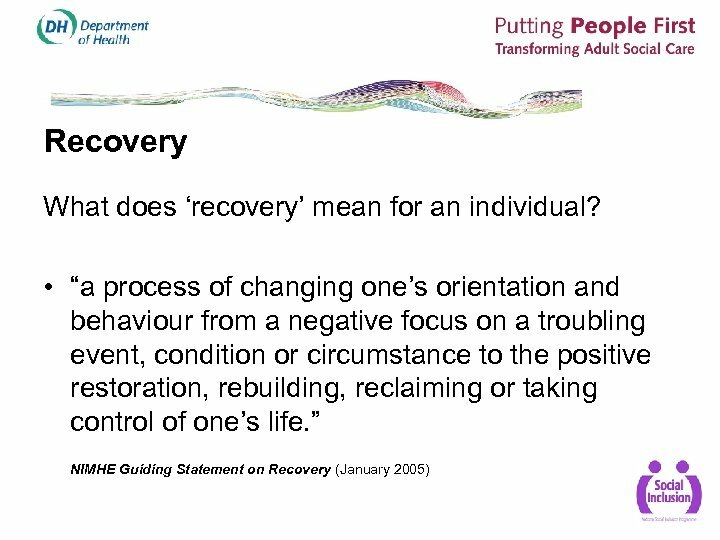 Individuals with lives and relationships. 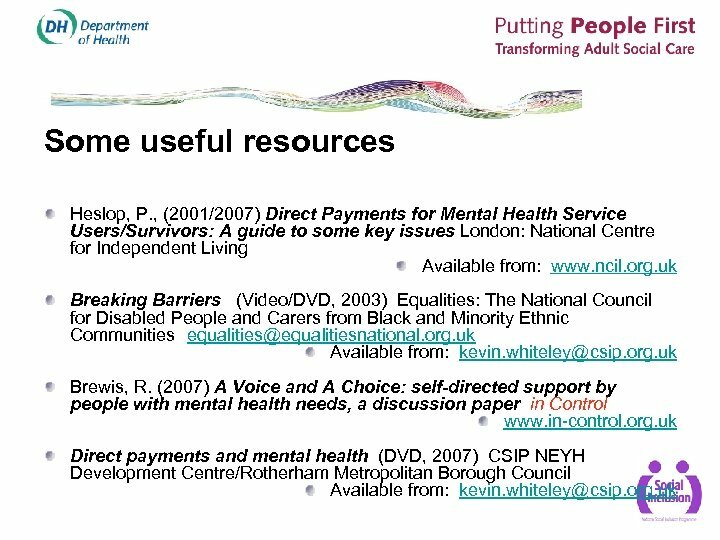 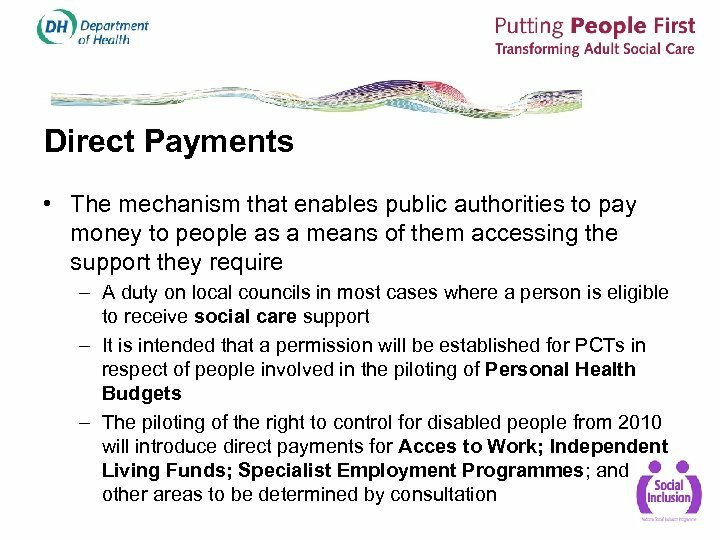 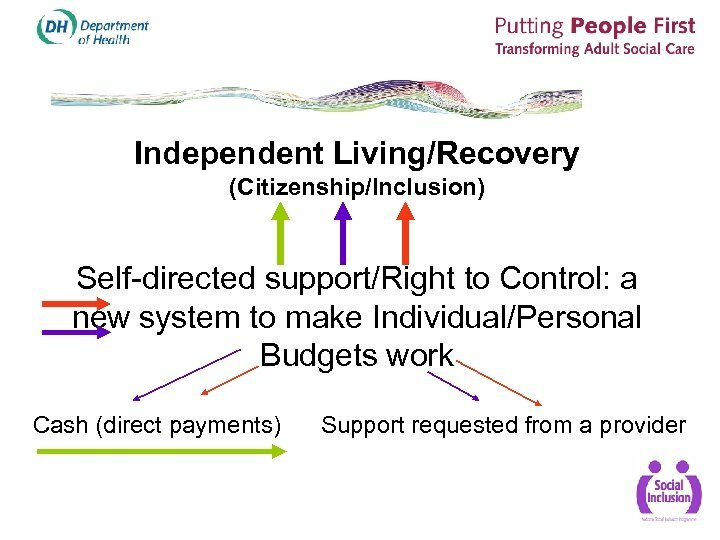 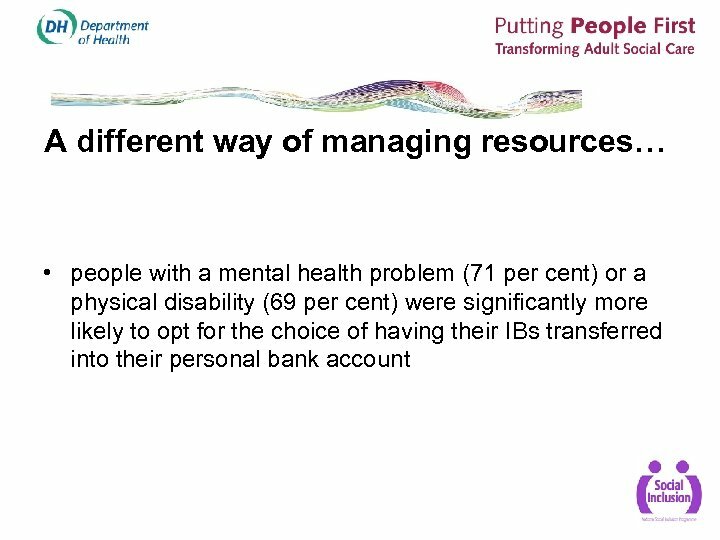 Support that’s available for people to stay independent for as long as possible, people choosing who provides their support and what form that support takes, and controllling when and where those services are provided, rather than being expected to fit in with what’s already on offer. 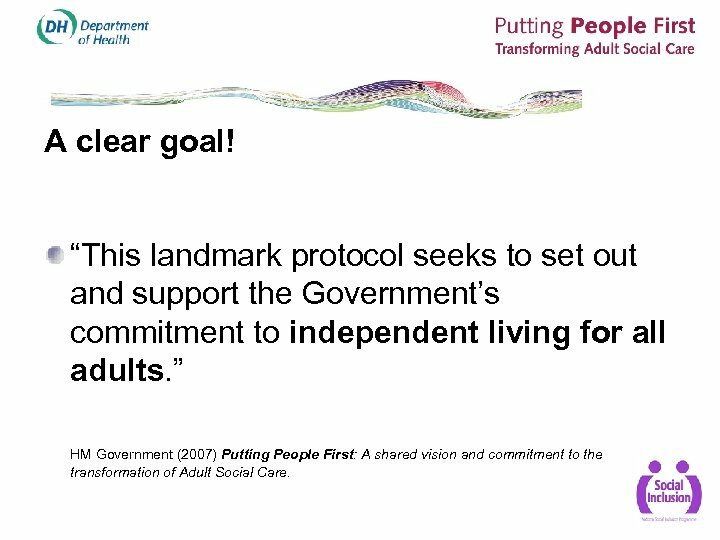 A clear goal! 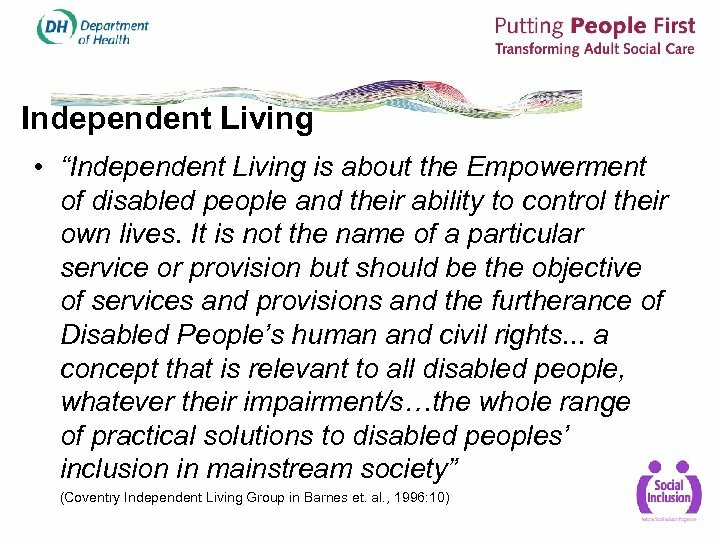 “This landmark protocol seeks to set out and support the Government’s commitment to independent living for all adults. 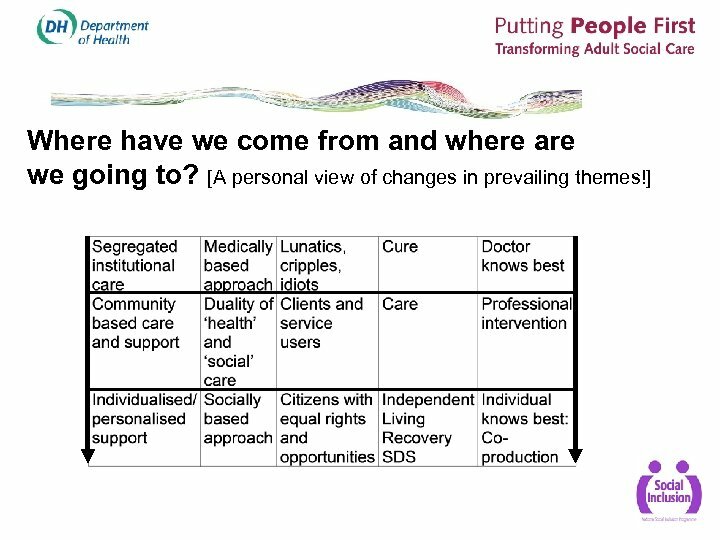 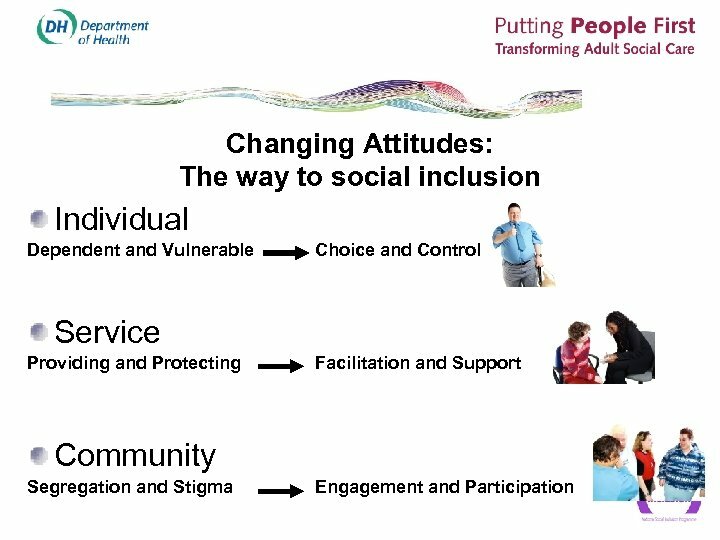 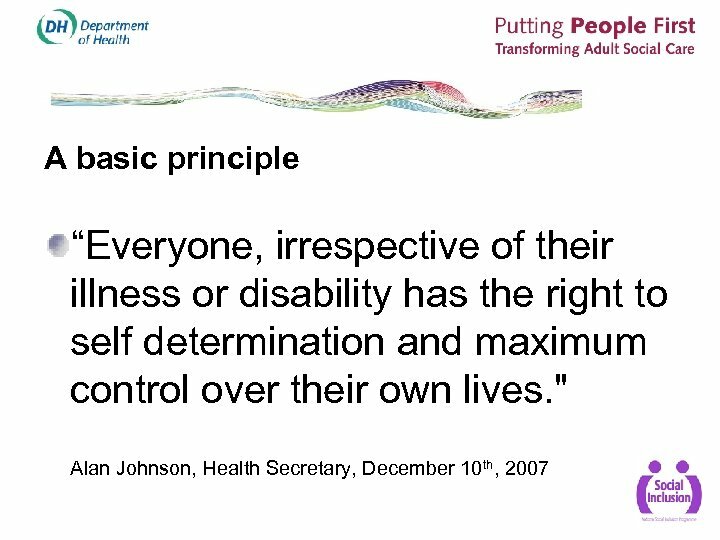 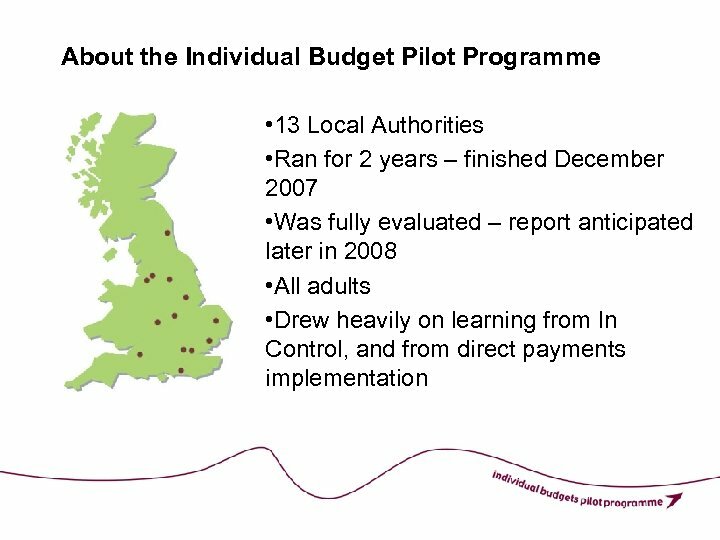 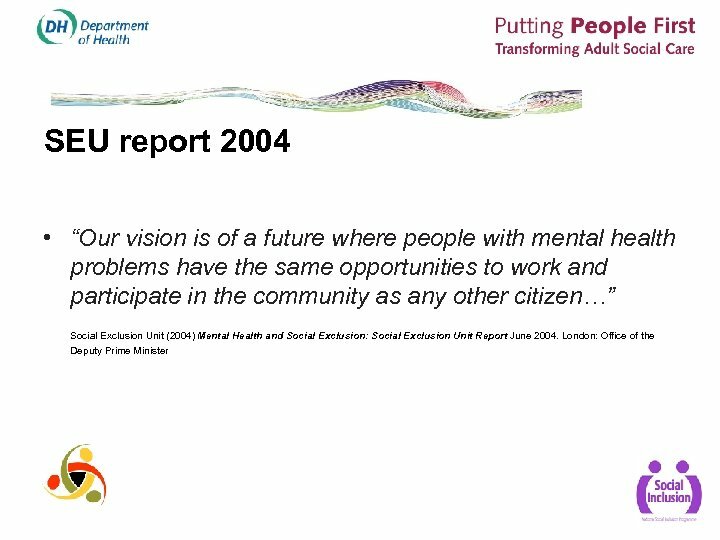 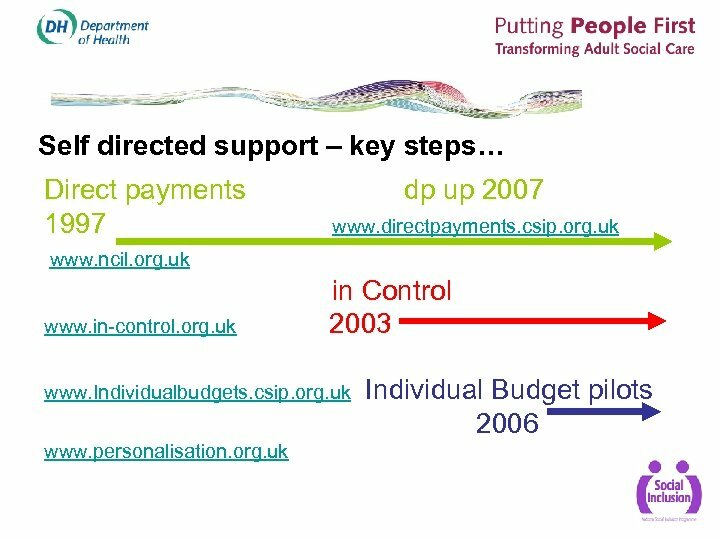 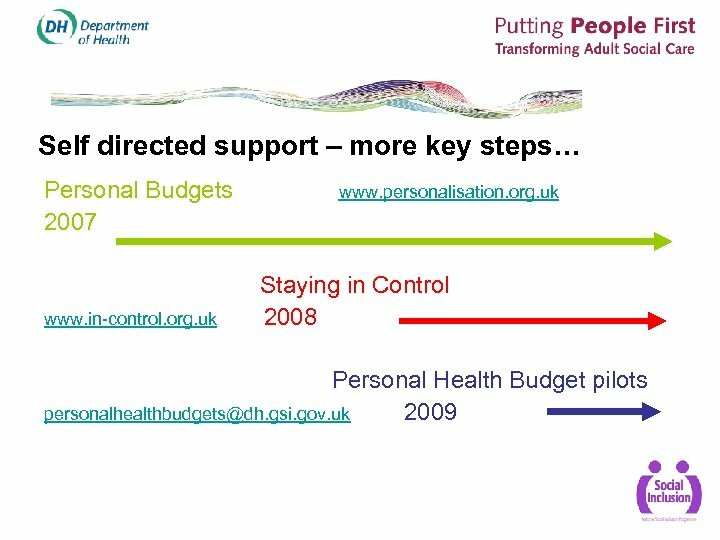 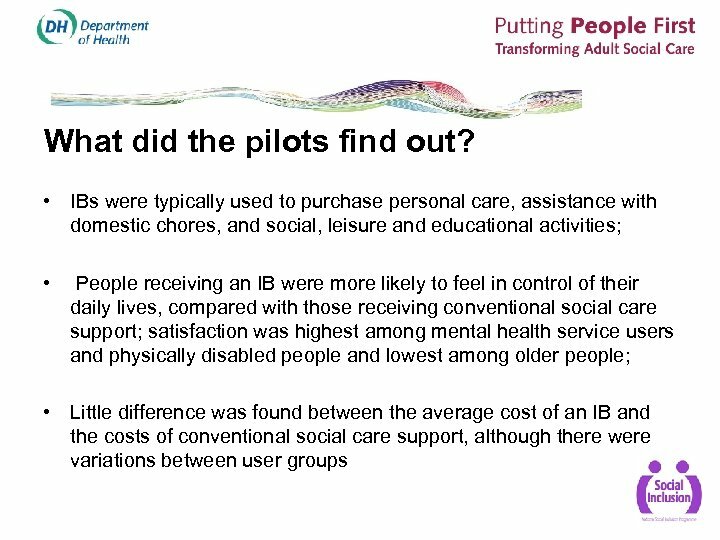 ” HM Government (2007) Putting People First: A shared vision and commitment to the transformation of Adult Social Care. 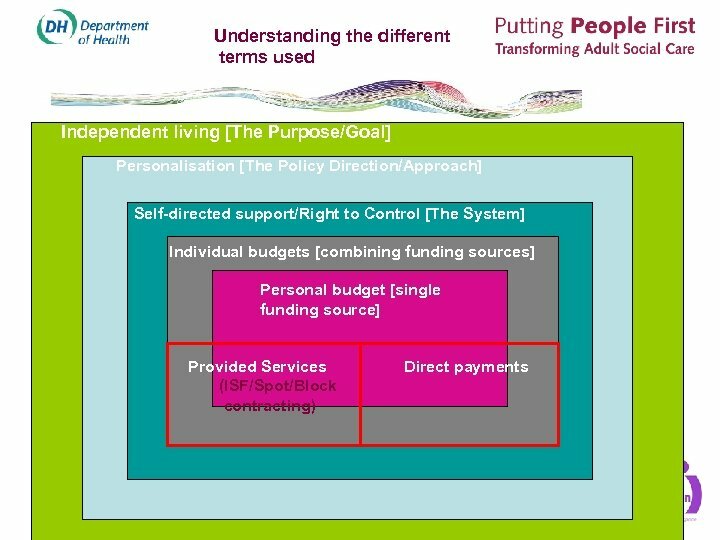 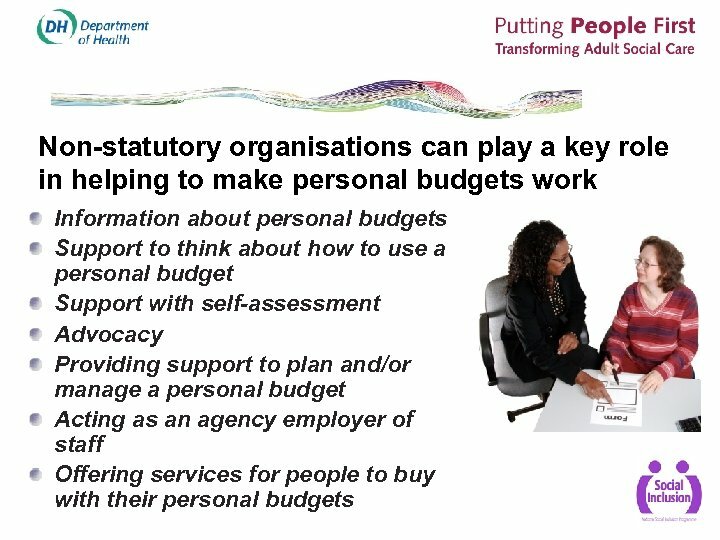 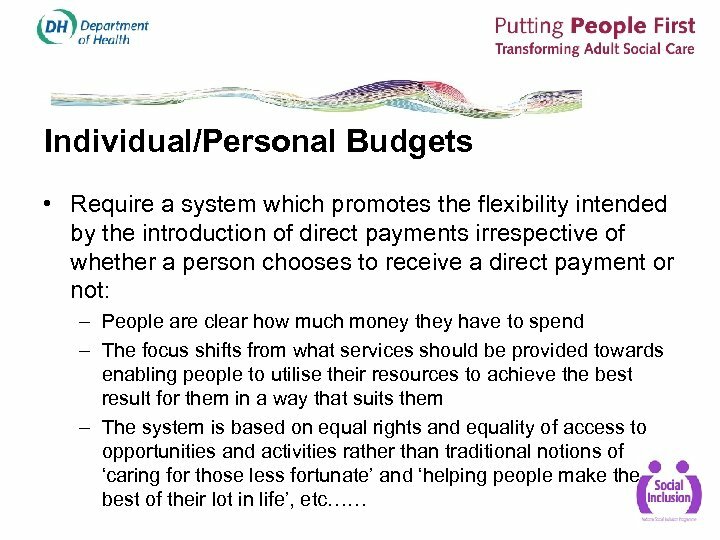 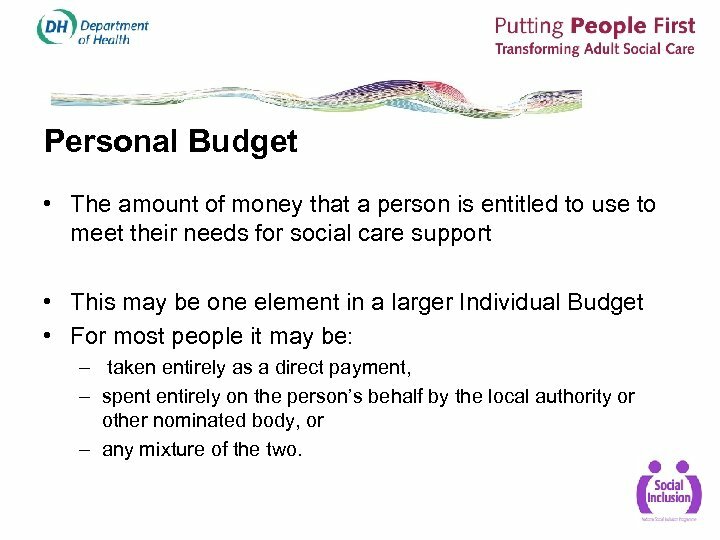 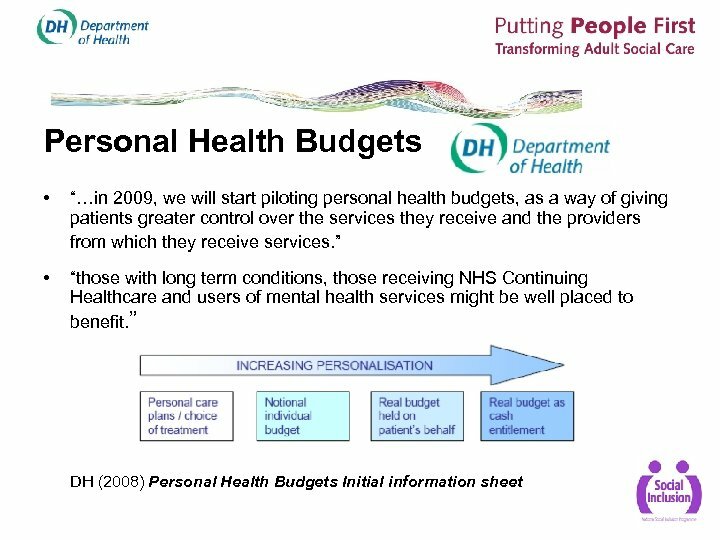 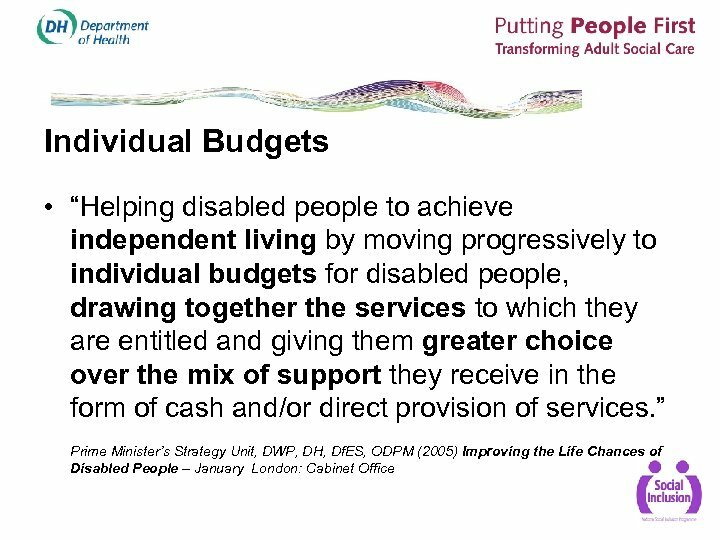 Personal Budget • The amount of money that a person is entitled to use to meet their needs for social care support • This may be one element in a larger Individual Budget • For most people it may be: – taken entirely as a direct payment, – spent entirely on the person’s behalf by the local authority or other nominated body, or – any mixture of the two. 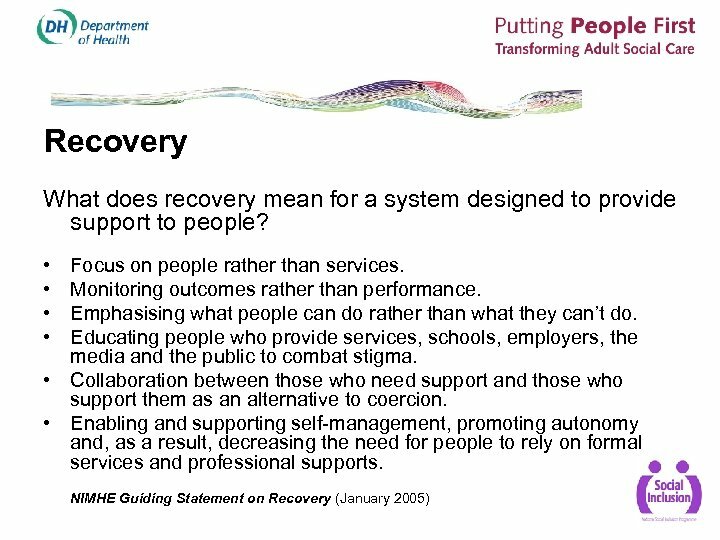 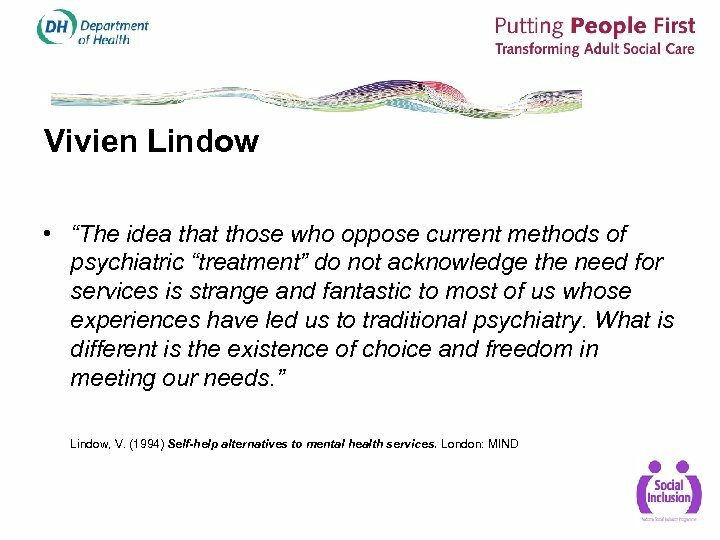 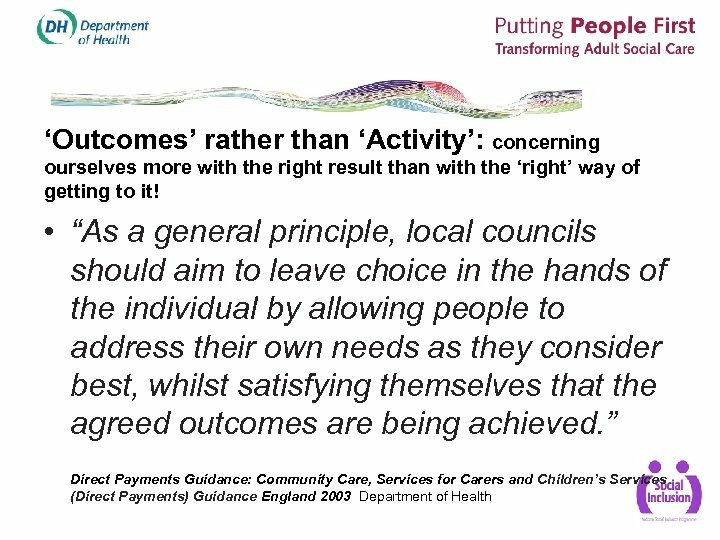 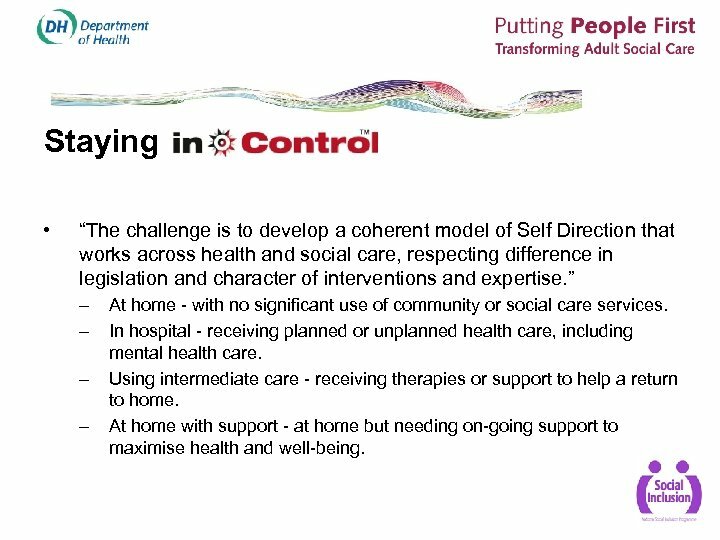 Staying • “The challenge is to develop a coherent model of Self Direction that works across health and social care, respecting difference in legislation and character of interventions and expertise. 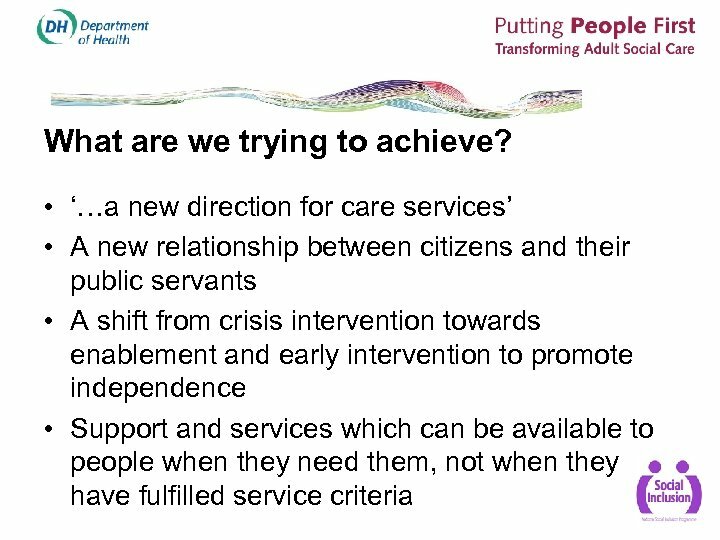 ” – – At home - with no significant use of community or social care services. 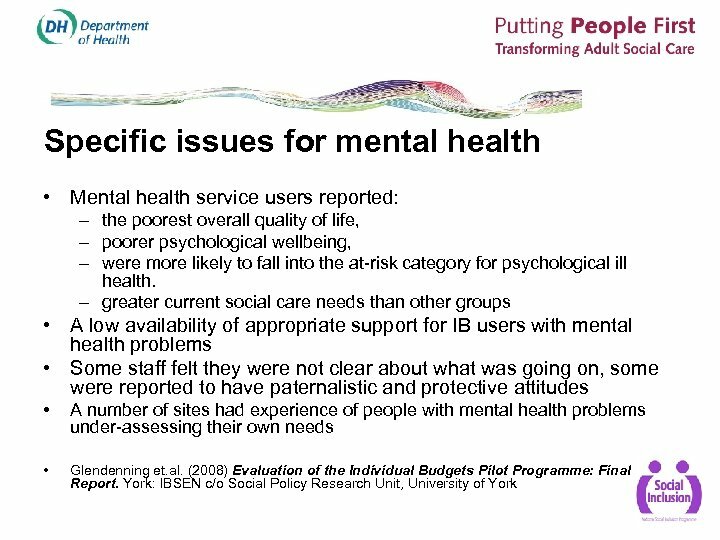 In hospital - receiving planned or unplanned health care, including mental health care. 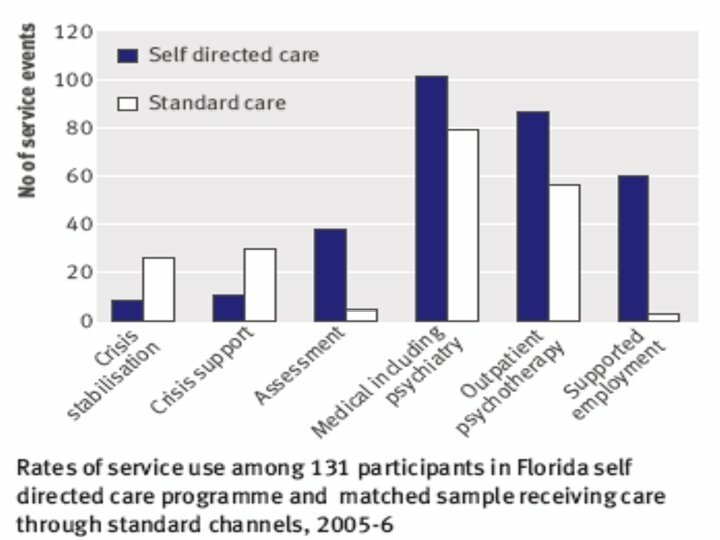 Using intermediate care - receiving therapies or support to help a return to home. 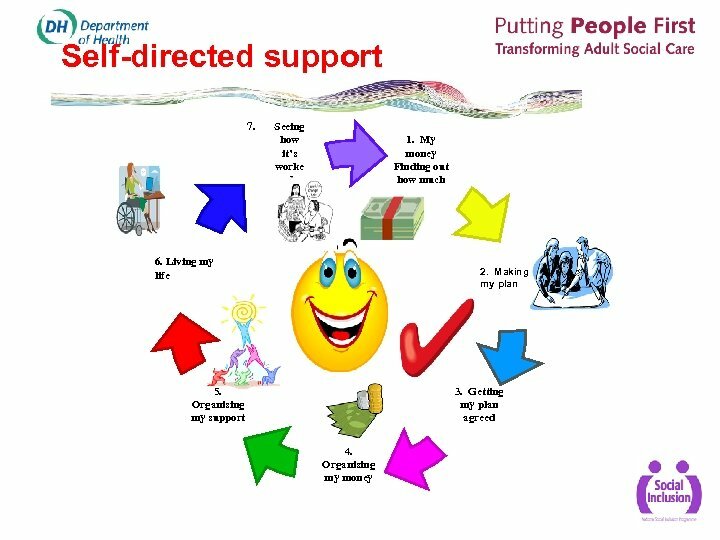 At home with support - at home but needing on-going support to maximise health and well-being.